Loyalty programs are top of mind these days. As the competition for share of wallet—or shopping bag or household budget—intensifies, more consumer product and service companies are adding loyalty programs to their marketing mix, and customers are signing up. The number of rewards programs jumped 27 percent from 2010 through 2012, according to research firm Colloquy. Membership has soared as well. The average U.S. household has 22 loyalty-program memberships and actively uses 10. (How many loyalty cards are in your wallet? How many tags hang on your key chain?) Some companies generate up to 60 percent of their revenues from loyalty program members. Loyalty programs began as a tool of the travel industry, in which customer spending is high but the incremental cost of rewards is low. Customers assign a high value to a free hotel room or airline ticket, while travel companies can give these away virtually for nothing so long as the hotel or flight is not sold out. Loyalty programs have expanded into a host of other sectors with very different economics—in which rewards cost companies real money—including everyday-purchase categories with lower average prices and margins, such as convenience stores and gas stations. Many brands are now launching their first loyalty programs; others are relaunching programs for the third or fourth time. Long-time loyalty players continually adjust and improve their programs, raising the bar for new entrants. Market leaders refine, redefine, and reinvent the loyalty experience in a continuous effort to push incremental share—the combination of growth in membership and the additional amount spent by members—to new heights. But how well do loyalty programs actually work? How profitable are they? Despite the expanding view that every consumer-focused company needs to consider including one as part of its marketing strategy, there is little consensus about what makes a program successful. Many different models are in use, and it can be difficult to determine which approaches truly foster increased loyalty and drive profitable incremental share. The Boston Consulting Group has worked with hundreds of companies in such industries as travel, retail, and financial services, helping them design, implement, and redesign loyalty programs. Although each plan must be brand consistent and tailored to the company’s customer base and margin structure, there are some common principles that underlie successful models. Companies that design and execute programs that are built on customer needs and are closely integrated with broader brand and marketing goals find that the cost can be unexpectedly low—and the returns surprisingly high. For others, the price of simplistic or poorly planned programs can be painful. This report examines how smart brands—including both those new to the game and those that have been playing it for a while—make their programs rewarding for company and consumer alike. The value of a loyalty program can be determined using a formula developed by BCG that is based on the loyalty margin. Any program’s value is a function of the loyalty margin—the benefits that the program offers to customers relative to the cost of those benefits to the company—as well as the incremental share the program generates and the size of the program. (See Exhibit 1.) In our experience, the design of a program, including even minute details, can have a substantial impact on the size of each of the three factors: loyalty margin, incremental share, and program size. Loyalty Margin. The loyalty margin is a function of how much of a particular kind of product or service a company gives away and how fast it does so. This calculation is the foundation of every loyalty program: it determines the program’s attractiveness, its underlying economics, and its degree of flexibility—the ability to tailor the program to various user groups. Loyalty programs originated in the travel industry because airlines and hotels have high-value, perishable assets—airline seats and hotel rooms—that they can give away at little or no incremental cost. (A “free” hotel room costs the hotel only the expense of cleaning the room—in a hotel that is not sold out. But to the customer it can be worth several hundred dollars.) Travel companies have high loyalty margins. However, if a retailer gives a price discount, the loyalty margin is narrow to nonexistent. The company invests 5 percent of revenues, for example, in a 5 percent price cut, and the customer values that reward at—you guessed it—5 percent. In this instance, the fact that the loyalty proposition and the reward are totally transparent actually undermines the company’s ability to expand its margin and leverage its loyalty economics. In fact, by giving what is in effect a discount, the company has set a new price for the product or service—a move that competitors can easily copy. For this reason, many programs use points and recognition systems that set varying speeds at which customers can earn and redeem rewards. Points provide several attractive benefits for companies, including the ability to pace how quickly customers reach reward levels, the luxury of a floating currency that the company controls, and a simple means for expanding the number of reward mechanisms. Points are particularly helpful in sectors in which the loyalty returns are low, the result of companies giving away tangible goods with real costs. Companies can use a variety of components—points, reward tiers, and non-dollar-based rewards, for example, some of which have bigger costs than others—to manipulate the loyalty margin. Loyalty programs also provide mechanisms for low- or no-cost gestures of recognition, such as tiers and in-store benefits, which customers appreciate and respond to positively. A coffee shop can, for example, greet its best customers by name and give them access to new products that add little to the shop’s costs. Incremental Share. Incremental share also determines a program’s economics. If a program gives away rewards but fails to cause customers to spend more, it becomes no more than a recurring marketing cost—and not a very effective one at that. For a loyalty program to be profitable, customers must contribute more in incremental-margin dollars than the company invests in funding the program. The most profitable programs invest more in their customers who spend more. This is the basis for tiered rewards programs, which seek to increase spending and incremental share by laying out what the company will do for those who meet climbing expenditure thresholds. The targets and qualifying time (usually a quarter or a year) are defined in advance, and customers are given progressively more valuable rewards as they reach each spending target. If a tiered program is designed correctly, it drives significant incremental share with a company’s most loyal customers. In many cases, the added benefits—for example, seat upgrades on a plane or the ability to choose one’s own hotel room—have a high loyalty margin because they are inexpensive to provide. Getting the balance right is critical for success—and profitability. If a company gives away too little, customers won’t spend more. If it gives away too much, costs will exceed the value of incremental share. Program Size. That program size determines how much profit the program contributes is a straightforward but critical point. When a company is establishing a new program, it cannot yet know what the optimal loyalty margin will be or what incremental share it can achieve. The company should start small enough to limit the downside and minimize the impact of early design mistakes, including a trial period during which it can iron out the economics before scaling up. The program must have enough critical mass, however, particularly on the reward side, to attract members. Additionally, the company will need to grow the program sufficiently to get a good handle on the fixed costs. Once a program proves its profitability, generating a sustainable loyalty margin and a healthy incremental share, the goal should be to increase its size and attract a larger portion of the company’s customer base to contribute greater profitability and tie customers more closely to the company. Growing too slowly can undermine a program’s impact, but if a company is going to make a mistake on speed, it’s better to go too slow than too fast: once a program is established, pulling back can be painful. The loyalty margin equation plays out differently in different categories. Margin is driven by the costs of a company’s underlying products, while incremental share and program size are functions of consumers’ interest in and engagement with the category. It is easier to make programs economically viable in big-ticket, relatively high-frequency categories, but all kinds of companies are becoming more sophisticated in program design, including those that are demonstrating that carefully constructed loyalty programs can work in small-ticket categories as well. Companies offer many different types of rewards in their loyalty programs. Most programs generally pull one or more of three kinds of loyalty levers. Earn-and-Burn Levers. Customers reap the benefits of their purchasing activity (earn) with rewards at preset thresholds (burn). Earn-and-burn programs include classic frequency programs (a customer buys ten sandwiches and gets one free), points programs (customers earn points and redeem them for free products), and discount programs (members receive price discounts). Recognition Levers. Repeat customers are eligible for differentiated services earned on the basis of, for example, total account balance or total amount spent. These programs are particularly prevalent in the travel industry, which uses them to attract and reward high-value customers. Some of the more common forms of recognition include free perks, such as upgrades or the ability to jump to the front of the line at restaurants, branded membership cards and bag tags, expressions of personal recognition during the service experience (“Thank you, Mr. Smith, for your loyalty; you are one of our best customers.”), and progressively elite rewards tiers. Some rewards programs combine earn-and-burn programs with recognition programs. Customer Relationship Management Levers. CRM levers use purchase data that is captured and mined to develop tailored communications and targeted offers. These programs often do more than simply reward loyalty, and many depend on earn-and-burn mechanisms to generate the data for CRM analysis. Examples include members-only promotions (such as special quarterly points programs), targeted promotions and circulars, targeted communications (such as e-mail that touts specific hotels on the basis of customers’ previous travel records), and tailored website content developed on the basis of earlier visits and searches. Retailers, which are often limited in their ability to offer rewards because of the low-margin nature of the business, have been shifting to more CRM- and recognition-based plans as these programs become more sophisticated. CRM data is also valuable far beyond shaping the optimal loyalty design. The data can inform broader business decisions, including new-product development, merchandising, pricing, and store design. Many programs employ, or rely too heavily on, only one of the three main loyalty levers (most commonly earn-and-burn), inhibiting effectiveness. Each lever has its shortcomings. The high cost of earn-and-burn program rewards undermines the loyalty margin. Recognition-based programs limit the number of participants. CRM-based programs can undercut both incremental share and program size. The best programs use a combination of all three approaches and invest in the incentives that increase incremental share while maximizing the loyalty margin. This dynamic depends on the market and the customer needs of the brand. The companies with the most successful programs continually adjust the levers to meet evolving circumstances. As in other aspects of their business, companies do have to spend money to make money. The rewards-program break-even point is not easily reached, but in many cases, the returns rise rapidly after that. For example, our research shows that a loyalty program that costs 3 percent of revenues breaks even at a 10 percent incremental share and generates 100 percent returns at a 20 percent incremental share. Consider a company with a 35 percent gross-profit margin. A customer who spends $100 a year before becoming a loyalty program member generates $35 in profit. Once part of the program, a member increases his or her spending by 10 percent to total $110. That increase contributes an additional $3.50 of profit before the cost of the program. With a program cost of 3 percent, expenses eat up most of the incremental profit (in this case, $3.30 of the $3.50). So the company essentially breaks even on the program, and the customer’s net-profit contribution is still $35. If, however, the new member spends $120 (a 20 percent incremental share), the additional contribution is $7 of profit, and the additional cost is $3.60. The company makes $3.40 on a $3.60 investment, or almost 100 percent. We expect loyalty programs to continue to grow, proliferate, and become increasingly dynamic. More customers are signing up, and companies are developing improved capabilities for managing program logistics and rewards mechanisms. They are also getting better at targeting high-value rewards and recognition. At the same time, program costs are falling. Declining hardware, software, and systems costs are a big factor, as is inexpensive data storage. Big-data analytical capabilities are increasingly available to businesses of all sizes. Companies also benefit from competition among vendors and agencies that specialize in loyalty program execution and management and from the rise of digital-only programs, which have limited marketing-collateral investment needs. Companies that have yet to integrate digital and mobile technology into their rewards programs will need to do so. The same factors that make these technologies—along with social media—powerful disrupters of the retail experience also apply to loyalty programs. These factors include wider selection and choice, greater transparency, location-based services, and the integration of friends into the shopping and rewards experience. Think about the ability to send messages to the smartphones of high-value customers known to be nearby, about a limited-time offer they can share with up to four friends. Moreover, digital data can help hone the loyalty margin to its sharpest-possible edge. The most profitable loyalty program gives away only what is necessary to drive the greatest incremental profit from a member. Using the three levers described above helps tailor programs to this goal. Data from digital interactions helps companies better understand members and their motivations in an even more tailored way, allowing companies to maximize the cost-benefit equation. Digital technologies help companies convert broad-based programs previously rooted to some extent in guesswork into highly focused programs based on hard data. Digitally capable loyalty programs are key to attracting younger consumers. BCG research shows that members of the Millennial generation—who outnumber the baby boomers and are entering their peak purchasing years—are heavy users of portable devices and are connected to brands wherever they go. Two-thirds of Millennials report that they use smartphones to access the Internet, far more than older consumers. They also engage with brands more deeply through social networks. More than half say that, at least occasionally, they use their mobile devices on social media to note that they “like” a brand, compared with only a third of boomers. Loyalty programs come in all shapes and sizes and demonstrate coincident disparity in their effectiveness. In the retail industry, for example, our analysis of six different company programs showed a range of increases in incremental share from 8 percent for one company to 114 percent for another. The results of the other four were spread across the spectrum. Most loyalty programs do an adequate job; few outperform. There is a paradox at work here. Customers want to engage more with loyalty. Program costs are falling. Yet the typical program converts only a fraction of customers, and then only a fraction of those who join actively participate. (Remember those 12 dormant programs per household?) As more competitors use loyalty programs, it becomes increasingly difficult to differentiate and deliver real value to customers. Loyalty programs have taken hold in the restaurant industry only in the past few years, but they are making their impact felt. 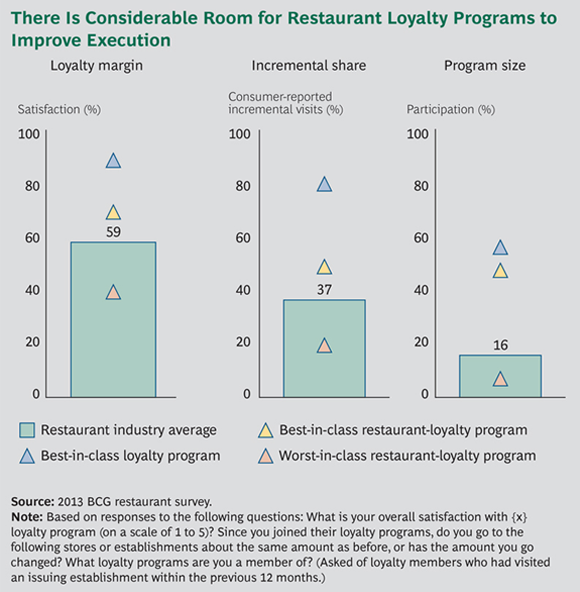 BCG consumer researchers found that nearly 40 percent of restaurant-loyalty-program members increased the frequency of their visits after joining full-fledged programs. Nearly 25 percent increased the amount they spent. High-performing, best-in-class loyalty programs, in many cases, see even more significant boosts—nearly 50 percent of members of these programs reported more frequent visits, and nearly 30 percent reported increased spending. Little surprise, then, that more restaurants are establishing loyalty programs. More than 90 percent of restaurant chains offer a program of sorts, ranging from an e-mail club to a full-fledged loyalty program. At the same time, more customers are becoming loyalty program members. The restaurant industry had more than 26 million loyalty-program members in 2012 and the highest growth in loyalty program membership among all sectors from 2010 through 2012, with incremental membership growth of more than 170 percent, according to Colloquy. That said, only about half of all restaurant patrons have joined a loyalty program. They cite lack of awareness of available programs as the number-one reason for not enrolling. For restaurants, signing up customers at the register is the most effective way to increase enrollments, but inconsistent in-store execution remains a prohibitive barrier. Like other industries, restaurants report massive variability in the effectiveness—and, consequently, the value—of their loyalty programs. Many programs offer only basic earn-and-burn reward structures. There is a large gap between best-in-class and worst-in-class programs, which is reflected in the critical metrics of loyalty margin, incremental share, and program size. The gaps are significantly greater in comparison with other industries, such as the airline, hotel, and banking industries, that have longer loyalty-program experience. Also as in other industries, the mobile-app loyalty experience is growing increasingly important, with major players—including McDonald’s and Burger King—redesigning and relaunching loyalty programs to incorporate new tools, such as digital loyalty cards and mobile wallets. Panera Bread, a leading restaurant in the fast-casual segment, has taken care to build a brand-supportive program, and it is experiencing success across all three aspects of the economics of loyalty. Our research indicates that more than 40 percent of its visitors are enrolled—the highest enrollment of all the chains we observed. MyPanera, which offers redeemable rewards on the basis of purchases, drives significant incremental visits and spending after enrollment. Although recognition is not explicit, the value of rewards is based directly on the amount spent. Panera takes its customers’ purchasing habits into account, using its individualized knowledge of each customer to create uniquely tailored rewards. Panera also leverages its loyalty program to “surprise and delight” customers. As opposed to traditional programs with point balances that make redemptions feel transactional, Panera reveals gifts unexpectedly, sometimes even offering items not traditionally for sale, such as exclusive previews, tastings, and special events. The company makes it easy for customers to enroll, engage, and redeem rewards. Start with a program that is modest but sufficiently substantial to attract members, and establish processes for gathering feedback that enables learning and adjusting as you move forward. Identify rewards and demonstrations of recognition that have low implementation costs but high value to customers—the fundamental components of your loyalty margin. Because these rewards and demonstrations of recognition will be part of your earn-and-burn, or recognition, structure, you must make sure that they are consistent with your brand. Use low-cost loyalty and customer-relationship-management vendors to capture relevant customer data. Mine customer data to create loyalty segments that are based on customers’ long-term value to the brand or company. Offer tailored promotions and products that are both in line with the overall marketing calendar and aimed toward increasing the long-term value of customers in each segment. Create a cross-functional team to support the loyalty effort, ensuring that it is tightly integrated with the overall marketing strategy and other channels of the customer experience. Once you have a proven design, invest in scaling the program. Continually monitor loyalty innovation and customer needs in your industry and update the program accordingly. Too many programs focus on only the most basic loyalty lever—earn-and-burn—which does little to deliver incremental share. While these programs reward repeat purchasing, they do not differentiate among customers or recognize a company’s most valuable customers, who often expect more from a loyalty program than just incentives. This is especially true of Millennial customers. These programs also risk “training” customers to buy on the basis of discounts rather than brand or product affinity. Brands intent on building loyalty use both rewards and recognition to increase the customer value proposition. Recognition programs provide differentiated services and offerings to customers on the basis of status. They drive incremental revenues from top customers who expect—and value—recognition from the brand. Many provide special surprise-and-delight benefits to top customers at low cost but high perceived value. Anyone who flies frequently is familiar with the multiple tiers that airlines have built into their loyalty programs. One leading retailer structures its program in six tiers with the threshold—and rewards—for each tier increasing disproportionately as customers move up the ladder. At the upper tiers, the company offers a variety of surprise-and-delight rewards—such as free in-store dining, no-cost alterations, and free repairs to worn merchandize—that are inexpensive to provide but to which customers assign high value. The goal, of course, is to encourage midtier customers to boost their purchasing to reach top-tier status. The company still benefits significantly from the big mass of lower-tier customers who participate in the interactive and data collection elements of the program without generating substantial program costs. The most sophisticated brands leverage customer intelligence with CRM programs to boost program incremental share through targeted promotions. There can be big variances in the importance of program benefits among customer segments. Customer intelligence helps assign the right attributes to the right customers. Understanding what customers buy, where they buy it, and how discount-oriented they are can shape targeted loyalty-program offerings and promotions. Customer intelligence can also inform the strategic expansion of offerings (for example, multiple options to earn and multiple options to redeem). This data is sufficiently valuable in a broader context—setting direction on such issues as pricing, inventory mix, and store locations, for example—that we have seen companies deliberately build break-even loyalty programs with the goal of generating a competitive database of customer data. One high-end retail chain installed a new CRM system that takes data from all the company’s sales channels—in-store, catalog, online, credit card, and loyalty program—and uses the information to segment customers into three groups by the amount they spend. It then subdivides these segments into more than a dozen groups on the basis of purchase history and frequency as well as other criteria. It uses the results to tailor not only customer communications and special offers but also store design, product assortment, and promotional campaigns. In the past several years, the cost of CRM and data-mining capabilities has fallen, making the payback on CRM programs more realistic for many brands. Successful brands are fanatical about providing the best end-to-end loyalty-program experience for customers. They ensure a seamless experience across all customer touch points, including enrollment, engagement, and redemption. Consumers continue to actively seek out ways to interact with their favorite brands. Today, this increasingly means interacting with loyalty members digitally and on their mobile devices. The mobile-app loyalty experience is gaining importance, with several major players such as McDonald’s and Urban Outfitters redesigning and relaunching programs to incorporate such innovations as digital loyalty cards and mobile wallets. There are additional strategic options for maximizing loyalty program economics. Loyalty program partnerships between complementary and mutually reinforcing brands add value for program members and company participants. Companies with more advanced programs are exploring the possibility of monetizing brand and loyalty expertise by reselling customer-segment-definition data and their data-mining capabilities. None of this is easy or accomplished using a cookie-cutter approach. Successful loyalty programs are tightly shaped around the individual attributes of each company and brand. “I’ll take 50 percent efficiency to get 100 percent loyalty,” the Hollywood legend Samuel Goldwyn said. More and more companies are happy to make the same trade, but they don’t have to sacrifice efficiency. As their programs proliferate, however, they will eventually become as intensely competitive as the businesses behind them. Companies embarking on their first loyalty programs—or relaunching their third—would do well to bear three fundamentals in mind: the best programs are tightly integrated with broader brand and marketing strategies; a program’s economic value depends on increasing the loyalty margin and the incremental share; and loyalty programs can complement the brand experience, but they cannot substitute for it. The companies that follow these precepts will turn their programs into true competitive advantages. They will also find their loyalty programs and their bottom lines richly rewarded. The authors are grateful to the following BCG colleagues for their assistance with the preparation of this report: Alexandra Brousseau, Guennael Delorme, Valerie Johnson, Erin George, and Jessica Stolbach. They would also like to thank David Duffy for his help in writing the report.